This cute but not particularly functional bike was spotted in all it’s purled, yarn and knitted glory on Wilson Street, Newtown. 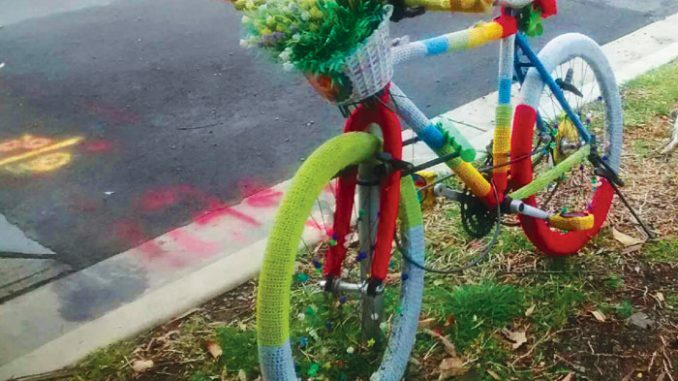 Entirely covered in technicolour stitching, we are not sure if this bike actually goes anywhere – especially considering the two hefty locks keeping this piece of guerilla art in place. Wilson Street is known as Sydney’s ‘cyclists highway’ with generous bike lanes that drop you straight at Redfern Station’s transport hub. The street is also host to one of Sydney’s first contra-flow bike lanes, which is even buffeted in some parts to provide extra protection against traffic. This very still bicycle pays tribute to all the bicycles in transit on this important stretch of cycling infrastructure.